I was first introduced to Melisa Dora’s work whilst curating the first Makers House in 2017. I loved the delicacy of her colour pallet and the way that her work can sit with a wide variety of other product styles, often tying the whole show together. So now over to Melisa to show us a glimpse into her South London studio space. My favourite working days are Thursday, Friday and Sunday as that's when I am in my studio. I really have to be organised with my work on these 3 days so I am either making work on the wheel, mixing up my own glazes, glazing my work, preparing the kiln or teaching!. There is never a dull moment, but it can be quite tricky at times to fit all of these processes in 3 days of the week. Well my favourite material is of course clay :D but my favourite clay is probably the one I am using now which is a white stoneware clay. It is a good canvas for my colourful glazes I use as well. Show us your workspace, are you clean or messy? I know these are professional photos so I had a little bit of a clean before the photographer arrived:) but I would say I am a tidy worker:) . I like everything to be organised and in its place. Its a bit of a nightmare if my space is not clean as I can't let the clay get contaminated with any materials hanging around. I mainly work on my own in my studio. I make all of my work on the wheel and glaze all of my pieces as well. I have recently got my sister to help me with mixing up glazes and a general tasks around the studio which has been great:D. My boyfriend helps me alot with general business support and advice. He likes to take me out of my comfort zone and always is so positive about everything which really helps in those stressful 'nothing is working' moments. I have so many dream homes I aspire to!. I just look in ELLE Decoration and fantasize that will be my living room one day!. But for now, here is my plant section of my flat. I made all of the plant pots and vases myself a few years ago when I had alot more time to be making work for myself:). And finally after all of that behind the scenes action here are Melisa’s products in all of their finished glory! 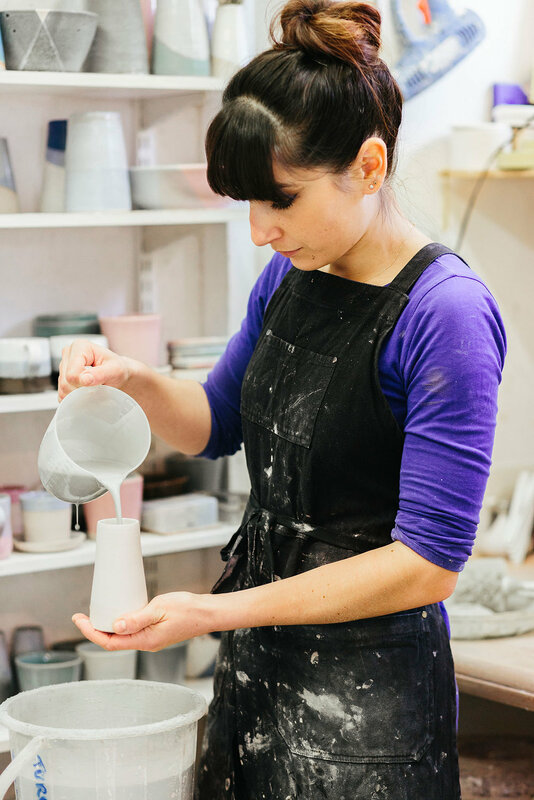 I hope you enjoyed seeing behind the scenes of Melisa’s practice, ceramics is such an intensely personal and solo pursuit that it is a privilege to get an insight into her practice. If you would like to find out more about Melisa’s work or even buy a piece then you can head to her website here or at one of our events later in the year. We have lots more inside the studio interviews lined up so be sure to sign up to our newsletter so you will be the first to know when they go live.